Oh no! This toucan is missing his beak. Help finish this picture by skip-counting by seven to connect the dots. This is a fun and easy way to learn the basics of multiplication, and your child will get to know the multiples of seven as she goes. Get ready for multiplication by practicing skip counting by 2. Skip counting builds a base for multiplication down the road. Numbers are a serious business, so no monkeying around as you practice skip counting. 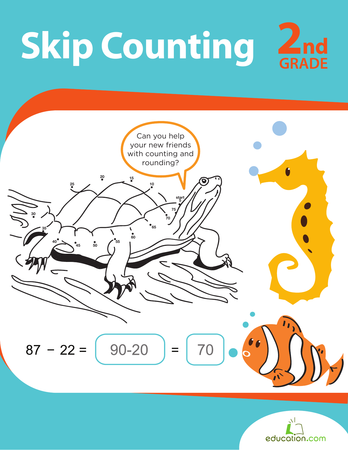 Your child will practice skip counting by 3s, preparing himself for multiplication as he goes. In order to reach her, practice counting by 8 as you skip down the stone path.